The Romance Dish: The Tastes of Christmas Return! Directions: In a medium bowl, beat together the peanut butter, cream cheese, and sugar. Gently fold in 3 cups of whipped topping. Carefully spoon mixture into the pie shell. Using a spatula, smooth mixture to the edges of the pie. Reserving 2 tablespoons of hot fudge ice cream topping, place remaining hot fudge into a microwave safe bowl or glass measuring cup. Microwave for 1 minute. Stir. 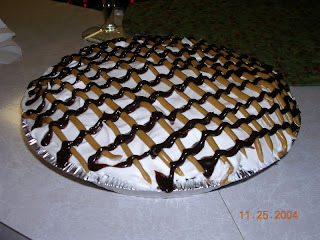 Spread hot fudge over pie to cover the peanut butter layer. Refrigerate until serving time. Just before serving, spread the remaining whipped topping over the hot fudge layer, being careful not to mix the two layers. Place the 2 tablespoons of hot fudge in a small baggie and knead for a few seconds. Cut a tiny hole in the corner of the bag and drizzle over the pie. Do the same with the 2 tablespoons of peanut butter going in the opposite direction of the hot fudge. Buffie says... Making sweet treats during the holidays is a family affair at my house. Now that the boys are getting older, they want to help make all the sweet treats. Of course, we all love sampling too! This coming weekend is our big baking weekend. The four of us will spend the entire weekend baking cookies and bars and making all kinds of sugary confections. This year I wanted to add a new recipe to our repertoire. We did a test run on the recipe last week and it was a big hit with everyone. And I love the fact that it is a no-bake recipe. I hope you will give it a try. Beat together butter and sugar until combined. Blend in vanilla. Add cake mix, flour and salt. Mix thoroughly. Add 3 tablespoons of milk (or more if needed) to make a dough consistency. Mix in sprinkles by hand. Roll dough into one inch balls and place on a parchment or wax paper lined cookie sheet. Chill balls in the refrigerator for 15 minutes to firm. While dough balls are chilling, melt almond bark in the microwave in 30 second intervals until melted. Stir between intervals. Once melted, quickly stir in cake mix until incorporated completely. Using a fork, dip truffles into almond bark and shake off excess bark by tapping the bottom of the fork on the side of your bowl. Place truffles back on the cookie sheet and top with sprinkles. 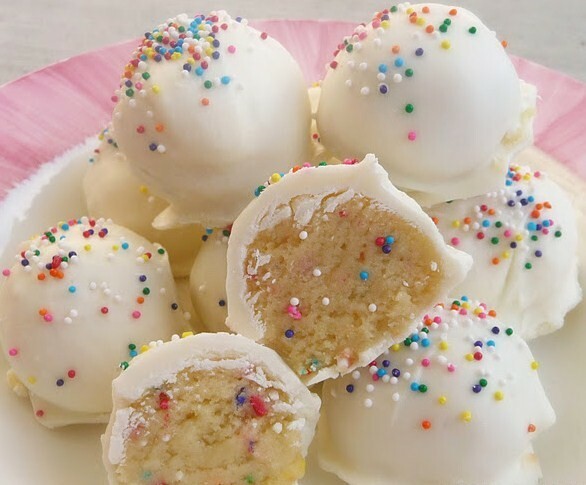 Chill cake batter truffles in the refrigerator until serving. Makes 24 to 30 truffles. You can change the cake mix flavor to make a wide variety of truffles. I love to get together with my friends and I often make this easy cocktail to create a party atmosphere. It’s called kir royale and it’s champagne with a slurp of crème de cassis (a French blackcurrant liqueur) to add that extra zing. Be careful you don’t get too generous with the slurp as the crème de cassis is strong in flavour as well as alcohol content! The deep purple liqueur should just add a blush of color to the champagne. I first came across this cocktail as the cool thing to drink in France when I visited in 1985. So it’s brings back memories of lovely travel for me. There’s a slightly less extravagant version with crème de cassis and white wine called a kir, but, hey, Christmas comes but once a year! By the way, check out the label of the liqueur. It looks like it’s handwritten, doesn’t it? Love that bottle! May you all have a merry Christmas! Gannon says... These are great anytime, but I've started adding them to our Christmas goodies that we share with friends and family. The recipe came from a friend of mine in Florida. Preheat oven to 350 degrees. Break graham crackers into sections and place on jelly roll pan. Melt butter in small sauce pan. Add brown sugar and boil for 2 minutes. Add pecans and then spread over graham crackers. Remove and let stand 2 minutes. Remove from pan while still warm and place on wax paper to cool. Janga says... This is a variation of a Betty Crocker Bake Sale winner. I’ve been using it since 1987 when I found it in a local cookbook. I don’t know which came first. We prefer the lighter chocolate of this recipe. The Betty Crocker recipe uses chocolate cake and semi-sweet chocolate chips. Prepare cake according to package directions. Set aside half of batter; pour remaining batter into a greased and floured 13-in. x 9-in. baking pan and bake at 350 degrees for 15-18 minutes. In a small saucepan, melt the caramels, milk and butter. Remove cake from oven and top with caramel mix. Add balance of batter and top with chocolate chips and nuts. Bake 20-25 minutes longer or until cake springs back when touched lightly. Refrigerate overnight. It can be served as is or topped with Cool Whip, whipped cream, or your favorite vanilla ice cream. It serves 12-18, depending on size of slices—and appetites. PJ says... As children, my brothers and I knew the Christmas season had arrived when we came home from school to find a platter of my mom's no-bake Chocolate Oatmeal Cookies on the dining room table. They're still family favorites today, bringing with them sweet memories along with their sweet taste. Boil sugar, margarine and milk for 2-1/2 to 3 minutes. 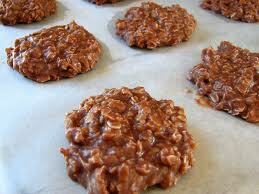 Remove from heat and add cocoa, vanilla, peanut butter and oatmeal. Beat until glossy and thick. Using a teaspoon, drop mounds of the mixture onto waxed paper. Let cool. That's what we're cooking up in our kitchens this holiday season! What are you making at your house? Holy crap, those look delicious. I wish I could bake. I'll try to convince my cousin to make the peanut butter pie or the truffles. Latkes,Latkes,Latkes! With lots of fresh Homemade Applesauce, YUM. I remember the year I was making them downstairs in the kitchen and the savory, oniony, and sweet apple/cinnamon smells were drifting upstairs where my son was doing homework with a friend. I called up to have them turn on the fan in that room to help dissapate the fumes. They yelled back in unison "WHY!" Andrea, I've actually made that peanut butter pie, only instead of cream cheese, I used vanilla ice cream and it was outrageously delicious ... like an ice cream sundae in a pie! Thanks for all the great recipes (eyeing those pralines and cake cookies, too and I love anything that smacks of turtles) and Anna, love your champagne indulgence ... wish they made low sugar champagne but then it probably would just taste like white wine. Love ya all. I can see I am going to be busy in the kitchen. I do have a sweet tooth. Morning All! I was supposed to be off work today but my schedule got changed so I won't be around to chat until later. Enjoy the recipes and I hope you'll share some of your own! Ooooo, Amy! I never thought to use vanilla ice cream. That sounds so good! I may have to try that this year. Thanks! We're not really into cookies, pies and things like that. I'll probably just bake a box cake and use our family staple fudge frosting. We also makes lots of creamed spinach and we almost have to use a scale to make sure everyone gets the same amount. A family of 6 and we all love cooked spinach. This recipes look great. I usually make some home made candies this time of the year. Not sure weather I will this year because Hubby is diabetic now and I know he will eat them if I make them. I love making peppermint bark. It's so easy to make yourself so you don't need to buy the expensive stuff in the fancy stores. I loved seeing the peanut butter pie. I have also made that several times in the past and it always gets "inhaled." Relatively easy to make and a sure winner. Thanks for sharing all of these goodie ideas. Oh my, I feel my waistband expanding just thinking about it all! Andrea, my husband is a peanut butter-aholic. LOL I'll have to make your pie for him. Jane, that's the wonderful thing about the cake batter truffles -- there's no baking involved. Hope you give them a try! fsbuchler, I have to be honest and say ... what's Latkes? Thanks for stopping by Amy! I love your idea of ice cream in peanut butter pie. Marybelle, sweet tooth queen here too! PJ, sorry to hear you got called into work on your off day!!! We also makes lots of creamed spinach and we almost have to use a scale to make sure everyone gets the same amount. Anne, that's so funny about the scale! I usually make some home made candies this time of the year. Virginia, you will have to share one of your favorite recipes with us. Connie, I'm SO into the easy recipes this year. All of these treats sound fabulous! My mom used to make marshmallow cream fudge that was incredible, but I've never been able to duplicate it. The Dreaded Soft Ball Stage defeats me every time. We like chocolate chip cookies, or ball cookies with peppermint cream filling and crushed peppermint outside. We make fruitcake from a family recipe every year. On Christmas morning, the dh makes Swedish pancakes like his mom used to serve. Jane, I'm getting hungry just looking at the pictures, too. Carol, I don't think that calories should count during the holidays. Oh, Amy, the vanilla ice cream in that pie sounds divine. Marybelle said: I do have a sweet tooth. Virginia, my grandmother used to make homemade candy. I never have, myself, but I love it. Connie said: I love making peppermint bark. Nancy said: On Christmas morning, the dh makes Swedish pancakes like his mom used to serve. What a nice tradition, Nancy! Gannon, thanks. We enjoy our Swedish pancakes, though the traditional lingonberry jam for filling the crepes isn't in just every store. The dh's mom used to serve lutefisk with them, but the dh had no desire to repeat that part of his childhood. Dishies, you're even more delicious than your recipes. And thanks for making me part of your family. Mwah to you all! My Christmas catering is going to be seriously under-value this year as my oven died a few weeks ago. I've been head down on a deadline so haven't done anything about getting a new one and I think it might be the new year before I do. But man, I'm missing the baked goodies! I love the Turtle Cake--I've made it frequently. The Peanut Butter Pie is a recipe I will be trying. Yum! We bake lots of cookies during the holidays and we always decorate sugar cookies. 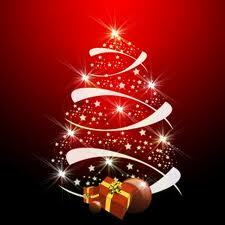 We will be out of town the week before Christmas, so will not be doing much cooking. If I do get around to making something, it will likely be rum balls, mince pie, and gingerbread men. We don't send out as many Christmas trays or Goodie Bags as we used to. I miss all the baking and visiting. All of these recipes look and sound delicious!! Latkes are a kind of potato pancake traditionally served during the Eight Days of Hanukah. Here are some sites that explain the holiday and the reasons for eating Latkes.